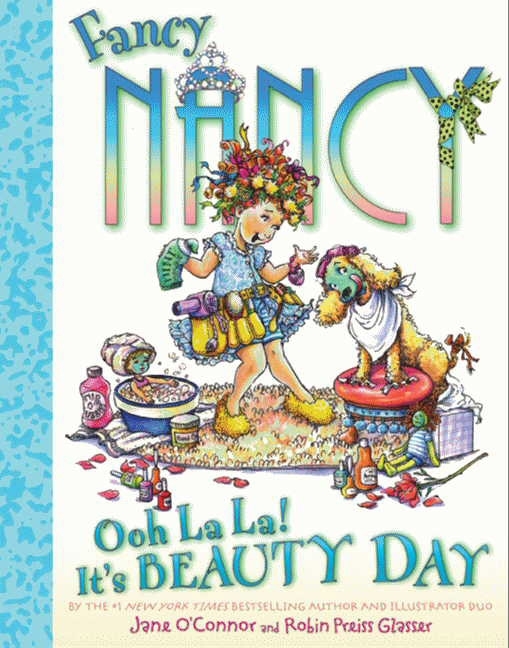 Last year, we took Fancy Nancy’s It’s Beauty Day out of the library. It was a perfect match, as my daughter is the girliest girly girl AND she loves Fancy Nancy too. The story is about Fancy Nancy preparing a Spa Day for her and her Mom, to get her mom all dolled up and ready for her anniversary dinner with her dad. The story is very sweet and has a big conflict (at the end of the Spa Day Mom’s hair is an absolute mess), which gets resolved by the end in a nice way. Also, like with all the other Fancy Nancy books, Miss I got to learn some more fancy words for her ever-expanding vocabulary (which means fancy for growing!). Cut to, Little Miss I wanted to do a Spa Day with me. When I was little, my mom would take me and my sister to a steam bath place, where we would play and do our very own spa sessions. What I remember the most were the face masks… in particular the honey one, which you could also stick your finger into and taste the sweet and sticky stuff. Taken in consideration that back when we first read the book (a year ago) I had been taking care of Tiny A (6 months then), I wanted to do this with Miss I, pamper her and start creating some memories of our own. Since then we’ve done more Spa Days together. We set the tub with aromatic salts or essence oils, get a couple of face masks ready, slice a cold cucumber, get the scrubbing salts out, then a nice smelling body lotion to finish the whole thing. With meditation music playing, we have our girls time together and get to relax. The face masks we use are all natural. I always like to start with an oatmeal mask, which is pretty much ground oats, mixed with warm water or chamomile tea, which you apply to face and neck, then let dry. That cleans up the pores and balances the skin’s natural oils. When I was younger and had a trouble T-zone, I used to do a mud mask instead. Then we do a moisturizing mask. We’ve done honey. applying it directly to face and neck and waiting for about 5 minutes, and avocado — just mush up some ripe avocado and apply to face and neck. This weekend I had a Spa Bath. My Mom gave me a foot massage. It felt good. And I also got Rainbow Looms for Valentine’s day and I also tried to read a whole chapter book and it was hard. It was a brief mention, but I’m glad that she enjoyed our Mini-Spa Day! What do you do with your daughter for a girls-only activity? Little Miss I’s Journal – If I were a cheetah. How sweet! I’m going to start doing this with my daughter! Oh, and I pinned this! I do love bringing fiction to real life, and real life to fiction 🙂 Thanks for stopping by! Though come to think of it, we have had some hikes that ended up a lot like mud baths…. I’m not much of a girly girl myself, but having a chance to pamper myself and my little one is actually fun 🙂 Thanks for stopping by! The cover is cute, but it was just 2 years ago that I started getting my nails done! (and I’m a grandma). Spent too much time with my horse for a ‘Fancy Nancy’ stage. Thanks for sharing on the Kid Lit Blog Hop.